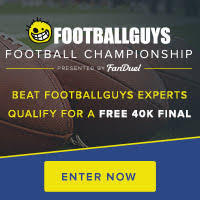 As we power through the miasma of Week Five, there are some interesting trends to note among the Footballguys.com Daily Staff cash plays for this weekend. HELLO Alex Smith - As Andrew Garda noted in Thursday Staff Cash Plays Alex Smith ($6,900) is a popular option this week, and that carried forwards from Thursday lineups to Sunday lineups - five Footballguys have Smith in play on Sunday. Philip Rivers ($7,500) is even more popular for Sunday - six Footballguys are rolling with San Diego against the Steelers' diminished team (both offense and defense are below-strength entering Week Five). Nick Foles ($6,400), Aaron Rodgers ($9,200) and Russell Wilson ($8,200) show up on one sample roster each this week. Ring My Bell - Le'Veon Bell ($9,000) continues to be a popular option for Sunday lineups with eight staffers dialing up Bell. Also, Jamaal Charles ($9,100) gained some traction at the high end of the pay scale, while Devonta Freeman is hugely popular ($7,600) appearing on seven lineups. Anthony Dixon ($4,500) is popping up some as well (two lineups), given the injury news for LeSean McCoy (hamstring) and Karlos Williams (concussion). With Allen Hurns battling ankle and thigh injuries, the staff is plugging in Allen Robinson a good bit ($6,300, appearing on four rosters). To change things up, I'm putting my usual exhortation to review the Footballguys.com Injury analysis here at the end of the column - For new readers to this blog post, I commend to your attention the injury analysis of Footballguys Dr. Jene Bramel (his body of work is HERE on Footballguys.com) and also Craig Zumsteg's Injury Report Insight, Week Five. If you are considering a potentially banged-up player for a DFS lineup this week, those writers' analysis will be key to helping you avoid a mistake in Week Five.